CS Final course is ten months duration course which is the final stage course after clearing the foundation course on the path of becoming a Company Secretary. The Institute of Company Secretaries of India has released new syllabus for the Company Secretary (CS) Final Programme. CS Final Study Materials have been incorporated with all recent amendments, circulars, and notifications. Below, we are providing the Study Material of CS Final latest editions applicable for 2017 exams. Interested students, please download the CS Final Syllabus Pdf from the below-stated links. Every stage of course is a mixture of postal tuition and optional coaching classes. 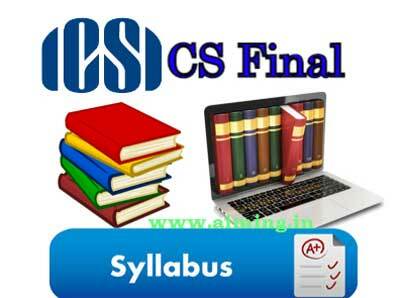 The CS final syllabus consists of theoretical examinations only, and total nine papers are there. Each paper contains 100 marks. The syllabus of CS final course includes topics like business communication, basic economics, company law, financial accounting, management accounting, banking & insurance, general and communication law, world trade organization and international trade etc. The subjects of the CS Final course is given below. Paper 9: Human resources management and industrial relations. Other Emerging and Contemporary Issues and Practices in Company Law. Drafting of Other Documents, Petitions and Applications.